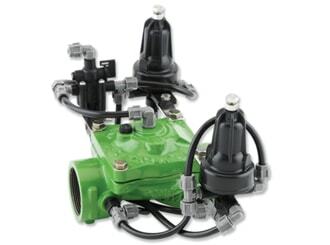 The BERMAD Model IR-420-54-3Q-bK is a hydraulically operated, diaphragm actuated control valve that accurately reduces higher upstream pressure to very low and stable preset downstream pressure. It is a Normally Closed valve that opens in response to a remote pressure drop command and shuts in the absence of that command. The BERMAD Model IR-420-54-3Q-bK also serves as a Pressure Relief Valve protecting the system even when in closed position. Simple In-Line Inspection and Service. relieves supply pressure peaks even when in closed position.